People in Bangalore are very much used to traffic jams and pollution. But people new to Bangalore get suffocated in the traffic jams and pollution. The vehicles smoke can be compared only with that of Chimneys of large industries venting flue gases. 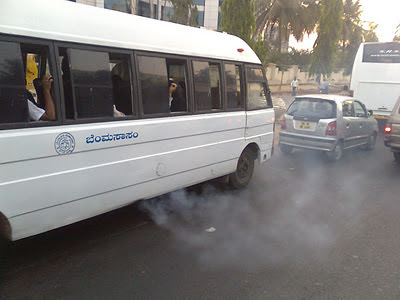 I even wondered how people can travel in city buses inhaling so much dust and smoke always, later got used to it and stayed for few years studying for my graduate course. I heard and read from the books that Bangalore is quite famous for its culture, weather and food. But by the time I landed up in Bangalore everything was changed in the name of development! Was just going through the pictures I captured on my phone, one caught my immediate attention it was taken on a traffic jam near Hebbal fly over. On one side Government through forest department creates awareness about the environmental pollution and on the other side the Transport department contributes its share in the pollution!